Coconut oil comes from – you guessed it – coconuts. Specifically, it’s a liquid that’s extracted from the meat of the fruit. A do-it-all super ingredient chock full of good fats, it has the power to energize, fight bacteria, keep the heart healthy and give us glowing, super-smooth skin. WHAT ARE THE SKINCARE BENEFITS OF COCONUT OIL? Naturally, we’re most excited about this part. Coconut oil benefits the skin in so many ways. It’s why you’ll find it in our hand soaps, body lotion and even body wash! It’s key to glowing skin. Rich in fatty acids, coconut oil deeply nourishes skin. Even better, your body absorbs it fast, leaving you with soft, radiant skin for hours and hours. It locks in moisture. 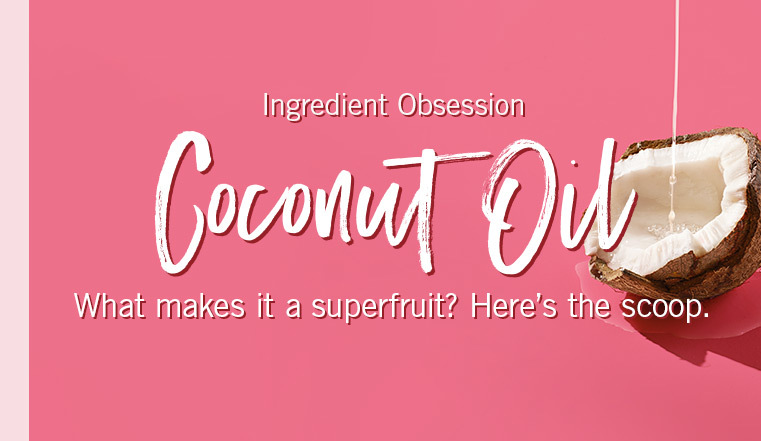 Like hyaluronic acid and shea butter, coconut oil penetrates deep into your skin, forming a protective barrier that keeps the bad stuff out – and the good stuff in. It’s an age-old wrinkle reducer. For centuries, it’s been used to help minimize wrinkles and age spots. It’s naturally antibacterial. There’s a reason it’s in some deodorants! And because it’s packed with lauric acid, it can even help prevent clogged pores and acne breakouts. It’s a mighty makeup remover. Coconut oil wipes away even the most resilient, waterproof beauties.